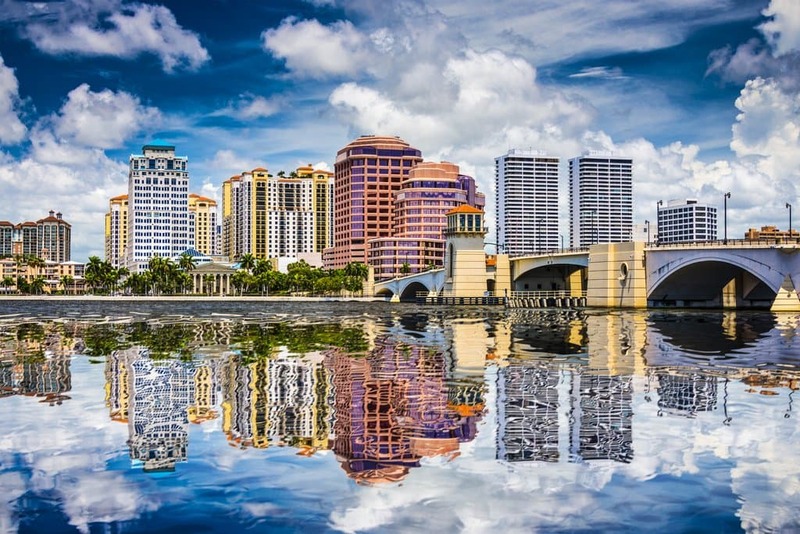 West Palm Beach, Florida, USA downtown over the intracoastal waterway. …on Palm Beach Life and Real Estate. President Trump is in the headlines every day and inevitably, when he is in Florida, Palm Beach is in the headlines as well. What is this free publicity or the “Trump Effect” having on the real estate market and how can Palm Beach residents plan for the next three years? Market Diversity. President of China’s visit to Mar a-Lago showed the Chinese market an inside view of Palm Beach and its luxurious offerings. The Chinese buyers and investors have only recently made a financial impact on South Florida and the free international publicity given to Palm Beach during this and many other high-profile visitors with media in tow, has many speculating on the bottom line impact for local businesses and real estate sales. New and broader audiences are good news as our Latin neighbors to the South are dealing with currency and inflation instability while our Canadian cousins, hurt by the exchange rate, have cooled their interests in a long-term Florida investment. Buyer market diversity is always welcome news as it leads to a more stable community less likely to be swayed by an individual market shifts whether in New York or Beijing. So, keep the PR coming, especially since this press is free. Increased buyer pool Palm beach offers some of the best Florida beaches, wintertime festivities and a who’s who social scene but if that wasn’t enough, it now has reclaimed its rightful place as a political Hub. It is fitting that Mar-a-Lago is the 45th President’s Winter White House as this fine estate has a history of courting and impressing the leaders of the world. However, not everyone is as pleased to see increased traffic and security delays that goes with having Heads of States visit your neighborhood with secret service in charge. Sleepy summers no more. Nothing can compare to Palm Beach’s fast paced social scene from November to April. I was fortunate enough to enjoy many seasons of the day and night high fashion, intense fun that the Palm Beach residents host during these months. I asked one renowned resident, how she could keep up the pace? She elegantly responded that Palm Beach hibernated during the summer months to restore its vitality. With the arrival of the 45th President that summer reprieve as picked up the pace. Now I could find a parking space on Worth Ave with less than 2 passes but the “in season” vibe can still be felt with the preparations of an upcoming 2017-2018 season of new and exciting visitors to the Island looking for the Florida DC experience. So as the vibe remains long after the last charity event was held in April 2017, so does the focus on one of Palm Beach’s most prized and limited resource, Real Estate. Where will your shoes end up when the new Season starts and how close to the action will you be, is at the forefront of many newcomer’s minds now. Therefore, whether it’s a remodel of your current abode, a relocation to be away from the congestion, or a you are a brand-new Palm Beach resident, new visitors and residents alike are already planning how they will position themselves in the sure to be lively social and real estate 2017-2018 season. Renee Marie Smith, Esq. is a 20 year Real Estate attorney, nationally recognized industry expert, distressed property speaker/educator, Florida closing agent and author of My Guru book series on the 2007 market collapse phenomenon listed on Amazon.com. She was the 2009 Host of the Fox29 Real Estate Guru Show and real estate agent educator in Nevada and Florida. She frequently guest speaks at national conventions and on radio shows on how the real estate industry has changed post 2007. She is also well published in real estate and business magazines/blogs including Forbes and Huffington Post.